At its heart this is a very local story, but one that should resonate with sports fans of any team or any league. The 2014 MLS season begins this weekend and two days before the season began, the Columbus Crew finally signed a deal to air their games locally on television after months and months of negotiations. A deal that has caused widespread outrage among the fanbase. After two years on Fox Sports Ohio, available statewide on most cable and satellite platforms, the team announced on Thursday that it had reached a multiyear agreement with Time Warner Cable to air games locally on the TWC Sports Channel. On the surface, this doesn't seem like a major development, but the devil is in the details. TWC Sports Channel airs exclusively on Time Warner (duh) and is not available on any other cable or satellite platform. If you're a Crew fan and don't subscribe to Time Warner, then this obviously puts you in a spot of bother. There are other avenues to watch MLS games though, particularly MLS Live (online) and MLS Direct Kick (the league's version of Sunday Ticket). For fans without TWC, this would at least provide a viable alternative, right? The team (or the league… or its broadcast partner(s)… it's not exactly clear who's responsible) has instituted a 75 mile radius to black out all Crew games on MLS Live and MLS Direct Kick. Home and, inexplicably, away. How blacking out a road game makes any sense whatsoever is some kind of Neil deGrasse Tyson stuff. This means that if you live within 75 miles of Crew Stadium you can only watch games on TWC, every other option will be blacked out. So if you're a Crew fan who is hoping to watch your team locally on television, you are firmly SOL if you aren't a Time Warner subscriber. 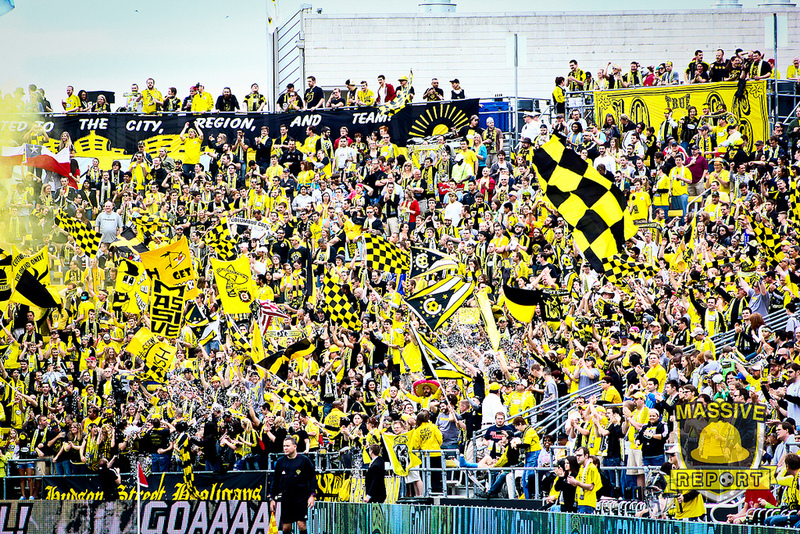 By signing with Time Warner Cable and instituting this harsh blackout policy, the Columbus Crew effectively cut off a huge portion of their local fanbase from watching the team play. What's more, there is only one Crew game on the national television schedule this season. To make it all the more unnerving, FC Dallas, another Time Warner team, does not black out their games on MLS Live. Why does Columbus have a blackout policy but Dallas does not? It's a serious question that incredibly at this time nobody seems to have a decent answer to. How are we supposed to support a team whose matches we can't even watch on tv? Literally dropping everything I own with a Crew logo at the front desk tomorrow. They can donate to charity. This is seriously one of the dumbest moves in the history of the franchise. how do you want the other half of your audience that doesn't have TWC to watch games? I can't understand excluding so much of your fans by choosing a limiting outlet. TWC has provided me with unacceptable service in the past. Judging from the responses I'm not alone. Way to give a big middle finger to 52% of your fans. The Crew won't see another dime from me! I loved watching the Crew, but if I can't watch them, then what's the point? And the same was true on Twitter…. I live 5 miles from @ColumbusCrew Stadium. I will see 1/34 matches on local TV this year. GREAT JOB @CREWPREZ AND @APRECOURT! The message from the team's front office? Crew President Mark McCullers encouraged fans to choose TWC as their cable provider. That was it. That was the message to fans disgruntled over the Crew's new TV deal. SVP of marketing Steve Malo unbelievably told Columbus Wired that fans could "utilize social media" to follow games in a statement that is simply too astounding to be fiction. That's a viable solution for fans of a professional sports franchise? What's next, should fans wait for telegrams to cross the wire? Some background – this is my local team so there is a vested personal interest in this story. I'm in the same boat as many of these disaffected Crew fans, who have gone to games and followed the team closely for years, without Time Warner Cable and within the blackout radius. Although Columbus is the 15th largest city in America, there's still a small market feel around the Crew. The team ranked 12th in attendance and 15th in team salary last season. But the past several months have presented a much needed time of rejuvenation for the franchise. The team has a promising new owner in Anthony Precourt, a new coach in Gregg Berhalter, and there's even been significant talk of a much needed rebranding. Precourt has spoke of lofty goals and said he wants the Crew to be the Green Bay Packers of MLS and bring the team into a modern age. But by relying on archaic blackout policies and agreeing to terms with a network that dramatically reduces the amount of local fans that can see games, it's sending the Crew back to MLS's stone age. TWC has promised that the Crew will be their #1 priority where at Fox Sports Ohio the team was always going to be behind the Reds, Indians, Blue Jackets, and Cavaliers in the pecking order. They're also offering original programming about the team. TWC may be able to offer the Crew more depth in coverage, but the sacrifice in losing so many fans along the way can't possibly be worth it, can it? When other leagues like MLB and the NFL are lifting or easing certain erroneous blackout policy, why on earth would MLS and one of its original franchises want to go the opposite direction? Stricter blackout policies goes against everything the league has tried to build in reaching out to its fans. And to think this comes at a time when MLS is doing everything they can to manufacture higher ratings across the board. The Crew is telling its most strident, loyal fans in their home market that they either have to become Time Warner subscribers or they can't be fans of the team anymore. Oh, or they could also theoretically move to Cincinnati or Cleveland to see their team play on television. There's no excuse for any soccer fan to be able to watch all 38 Norwich City games from the English Premier League and only 1 game of their local MLS team. There's no excuse for an MLS fan in Seattle or Philadelphia to be able to watch every Crew game while fans in Columbus can't. Unfortunately, this is becoming more of a trend across sports as teams move to exclusive, pricey cable channels. Fans are left with a difficult choice – pay up, change providers, or say goodbye to following your favorite team.